EH: So neither of you ever wanted to be an actress? KK: Acting is fun to do, but not as a career. I love doing costumes and props. I just love everything. That’s something I like about stage management: You get to work with all the aspects of theater. KM: I enjoy acting in theater so much that I don’t want it to be my job. I also have a certificate to teach stage combat. To do that, you have to know about acting styles and how to communicate with actors, but I never wanted it to be my career. EH: What are you doing next year? KM: I’m going to be the assistant fight choreographer for the Oregon Shakespeare Festival. I’m also the production managing assistant for the Rogue Valley Opera. 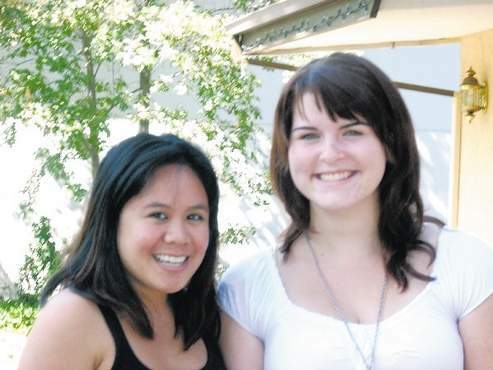 KK: Next term I’m interning at the Oregon Shakespeare Festival, and then I’m graduating from Southern Oregon University. KK: It’s just so exciting to be a part of something that people relate to, and that people put so much hard work into, and that creates this beautiful thing. It’s a play, and it’s been done thousands of times before, but each time, it’s your interpretation and your time, and it’s your show that you worked on. And it’s so exciting that you put some of your talents and your hard work into this play with other people and it creates something magical. There’s just something so exciting about that. KM: I’ve gotten so many close friends through the theater. There is nothing shallow about the theater, even though we have stereotypes like people who are drama queens. Most of the time, they’re a little overly dramatic because they are really passionate about what they are doing. I have found that, more often than not, they are really hard workers. All theater people are really hard workers. I appreciate that and I understand that. It’s just basic in theater people. When you are doing theater, other people are counting on you. When you are doing a piece of theater you’re making not only a piece of art, but something that has something to say about society and something to say about history. I feel that everybody in theater understands that, just as a basic. They’re not just doing it. Everybody has their own reasons for doing theater which are also very admirable as well, because it’s hard. It’s a hard business we’re in. I told Karen one time, I said, “This is so difficult. Why are we doing this?” There is something about it that pulls us all together. I honestly feel that I like being a stage manager just because of the people.